Padua's BSU did activities during Black History Week and Month to celebrate African American history. February was not only acknowledged as the month of love with Valentine’s Day, but was also Black History Month. Black History Month honors African Americans and their contributions throughout the United States history. The newly reformed club, the Black Student Union, planned activities within and outside of their club to celebrate Black History Month. To kick off the club’s first activity, the BSU went to the African American Museum of History along with other African American sites in Philadelphia on Tuesday, Feb. 22. Sallies’ BSU joined Padua on the trip. 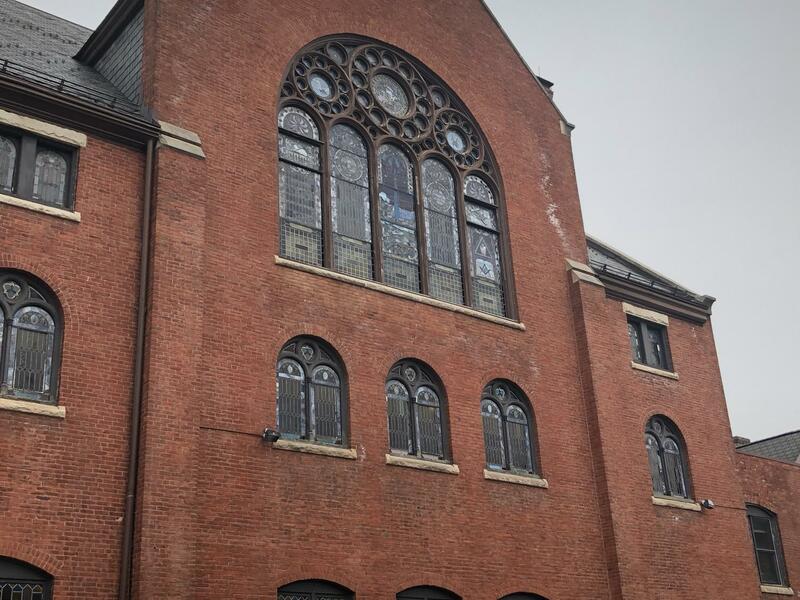 BSU visited famous Mother Bethel Church in Philadelphia. 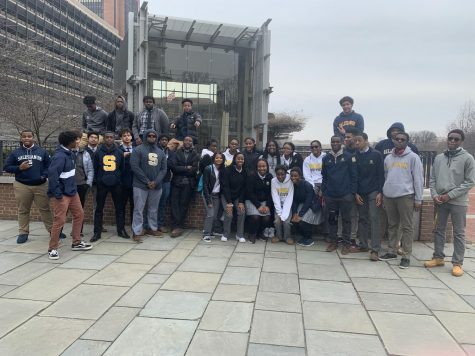 Joined by Sallies’ Black Student Union, Padua’s BSU went to Philadelphia to see African American culture. Sophomore Tolu Fajinmi, another officer of the club, believes that Philadelphia holds many artifacts. “[Philadelphia] was the city with many places for us to sight see about African American culture and that’s why we chose to go there,” said Fajinmi. Overall, the club believed the trip was a success. “We were able to educate ourselves on African Americans in history and that was our goal,” said Boateng Agyemang. The last week of February was Black History Week at Padua and BSU planned activities for the entire school. 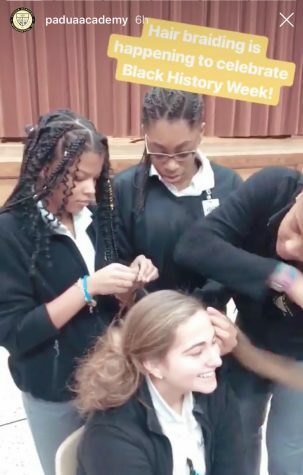 Girls from BSU braided cornrows into Padua students’ hair. 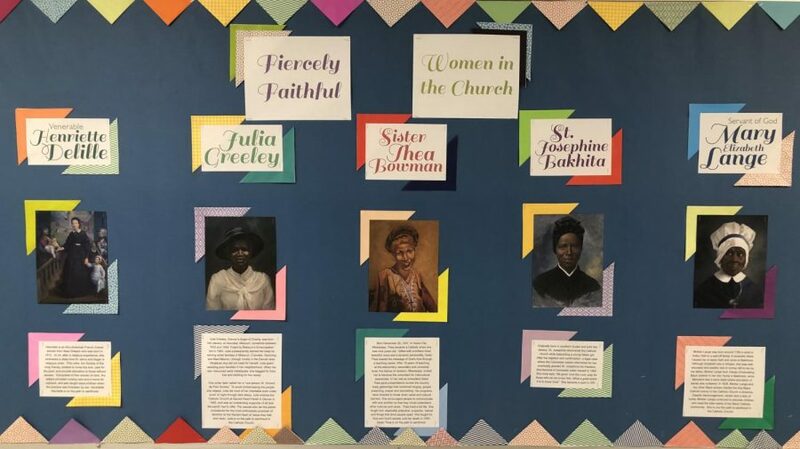 Throughout the week, prayer was centered around an African American figure. On Monday, Feb. 25, the club set up a cornrow braiding station in the cafeteria for the school as cornrows are an African-American hairstyle started by Caribbean Africans and named by slaves. On Thursday Feb. 28, BSU asked Padua’s cafeteria to serve a soul-food lunch. Soul-food is a variety of food from African American culture originating in the Southeastern United States. Foods such as fried chicken, mac and cheese, collard greens, and cornbread were served. The BSU also made an educational video and instagram post about significant African American women. The week was closed out with an African American prayer. Boateng-Agyemang and Fajinmi both found the hair braiding to be their favorite part of the week. BSU loved planning activities especially for Black History Month and cannot wait to plan for the rest of the year. “We were so glad the week was a success and hope we can do more as a club,” said Boateng-Agyemang.